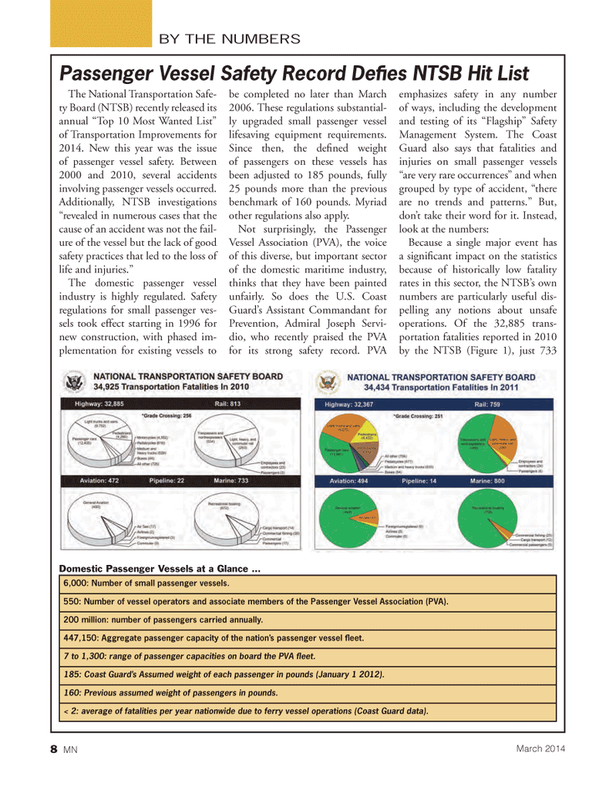 The National Transportation Safe- ty Board (NTSB) recently released its annual “Top 10 Most Wanted List” of Transportation Improvements for 2014. New this year was the issue of passenger vessel safety. Between 2000 and 2010, several accidents involving passenger vessels occurred. The domestic passenger vessel industry is highly regulated. Safety regulations for small passenger ves- sels took effect starting in 1996 for new construction, with phased im- plementation for existing vessels to be completed no later than March 2006. These regulations substantial- ly upgraded small passenger vessel lifesaving equipment requirements. Since then, the defi ned weight of passengers on these vessels has been adjusted to 185 pounds, fully 25 pounds more than the previous benchmark of 160 pounds. Myriad other regulations also apply. Passenger Vessel Safety Record Defi es NTSB Hit List 6,000: Number of small passenger vessels. 550: Number of vessel operators and associate members of the Passenger Vessel Association (PVA). 200 million: number of passengers carried annually. 447,150: Aggregate passenger capacity of the nation’s passenger vessel fl eet. 7 to 1,300: range of passenger capacities on board the PVA fl eet. 185: Coast Guard’s Assumed weight of each passenger in pounds (January 1 2012). 160: Previous assumed weight of passengers in pounds. < 2: average of fatalities per year nationwide due to ferry vessel operations (Coast Guard data).